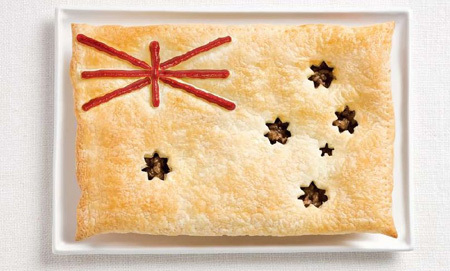 To get people excited about the Sydney International Food Festival and celebrate international food, national flags of participating countries were recreated using popular local foods of each nation. Where’s the flag of Hungary? I don’t call half of these “food” I call it body parts. Think of the suffering that you spare yourself the sight. What to you is merely a meal, to them is life itself. Yes, we want the flag of Hungary! I Love the Japan map!!! I wonder how they’ll manage Malaysia. Hi…I liked this one…just wished if the Indian Flag had something blue in the centre..for the CHakra..the actual colour…rather than the pink. 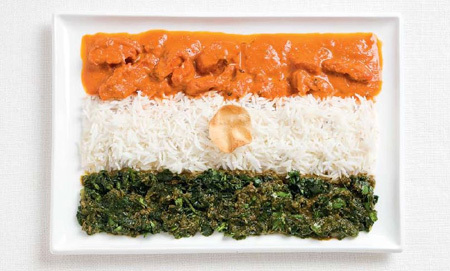 malaysian could do this with nasi padang, pempek palembang and some rujak cingur (indonesian food). just like they did b4. Hmmm a different try was awesome! Edward, today I’m going to eat twice as much meat as normal, just to make up for the meat you’re not eating. My friend Mike in college would always request extra servings of meat in the caf when eating with Jason (my vegetarian friend) just to prove that he is accomplishing nothing. If God didn’t want us to eat animals, then why did he make them out of meat? PS. Loving all the flags. I’m hungry now. 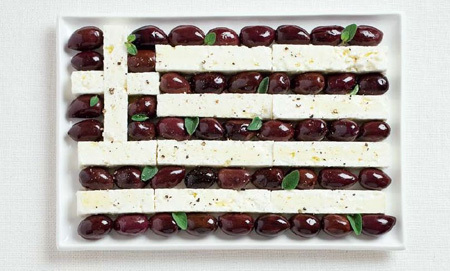 the greek flag is delicious!!!!!!! Where’s the flag of Jordan? Keep your meatless comments to yourself. MAN this is really awesome!! ahaha congratz. But yeah, there definitely needs to be the flag of the Philippines! I know what you mean, Edward. How many more olives have to die in the name of food? How many families of tomatoes have to be torn apart before we say no more? In the words of the late great Cesar Chavez – no uvas, my friend. No uvas. Well, I guess the food stylists need to have time to show off their creativity, too! It was fun to view! @Nelson, sure, let’s eat each other then since we’re all made of meat. Brilliant! These are really cool. You could make the UK flag with blackberries and strawberries, or the Irish with carrots, potatoes and cabbage. Wow – this would be great if I knew what any of the flags of other countries looked like! I miss Austria but the ideas are great! Thanks for sharing it! The circle of life requires carnivores. Shall we teach the lions that all life is sacred? I myself am an omnivore, just as nature intended. Now, if you want to talk about the brutality of modern livestock farming…go somewhere more appropriate. Awesome post, by the way. This could easily be expanded into a nice coffee table book. I too am going to eat twice as much meat today to make up for that which you aren’t eating. Some poor animal died people. And for what? To be turned into artwork? NAY I SAY! Therefore, I hope someone partook of those delicious creations. And that they said “Yum” after. As would be the proper way to show respect to those animals. You should make Romanian national flag: blue, yellow, red! Thanks! Those are great. A Swedish flag would be nice but I have a hard time seeing what you would use for the blue in the flag (the yellow could simply be potatoes). Pickled fish culture simply doesn’t lend itself to a lot of colourful variation. could they make a usa flag out of burger, fries, and coca cola? Wow, they’re great! And make me hungry. How can you make a USA flag out of McDonalds and fast food products? I agree that Edward’s comment was a bit harsh and forceful. But those that are replying to it aren’t coming off looking any better. “I’m going to eat twice as much meat now!”? Doesn’t anyone realize how childish that sounds? Where’s the Canadian flag made out of back bacon? I imagine an American flag could have barbecued pork ribs and buttermik biscuits for stripes and a big blueberry cobbler with star-shaped crust. We invented all of those dishes (well, not cobbler exactly, but we did come up with several variations). Sorry to get all nationalistic on you, but I just hate to see my country sold short. I want the flag of Hungary!!!! With some kolbász and some zöld paprika and of course the szalonna (or it could be pálinka as well instead of szalonna). But I like the first more. 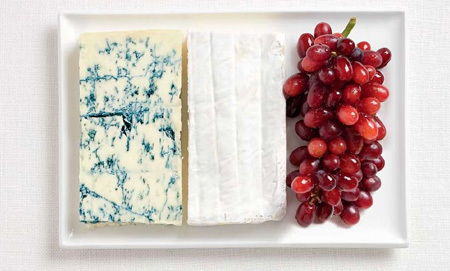 If you do the US you could use blueberries and cranberries which are native to the North America. Mmm…Pie anyone? 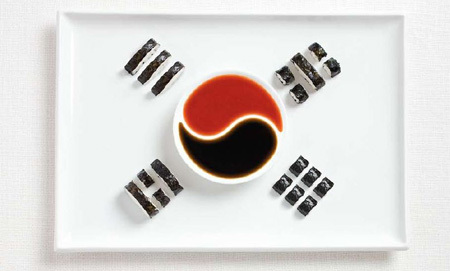 First of all, I think the Korean flag is the most beautiful piece of art food there is! Secondly, I am going to go and eat a big old cow tonight. Thanks Edward! I didn’t even want meat until I saw your comment!!! Lastly, America is not just hamburgers and fries we could have barbeque and cole slaw and beans or fruit like berries. Yum, yum. Food for thought: is there a distinction between factory farmed meat, eggs, and dairy eaten as a major part of one’s diet, and consciously & locally-raised meat, eggs, and dairy eaten as a small supplement to a majority whole-foods vegetarian diet? This question is for anyone, including those with impulsive, rash, and harsh opinions about diets that do or don’t include animal products. I believe we should consider many more worthy questions like this regarding food habits before we let our emotions and defenses (and the security of online anonymity) resign us to rude and impulsive comments. How could Turkey not be included??? They have the best cuisine in the world, hands-down!!! Italy is wonderful. But I want to eat the pastry of Austalia! But! WHERE IS THE USA! My wife say’s WHERE IS THE PHIlIPPINES! And I think that’s be a bit awkward to do. Spot on job, though! 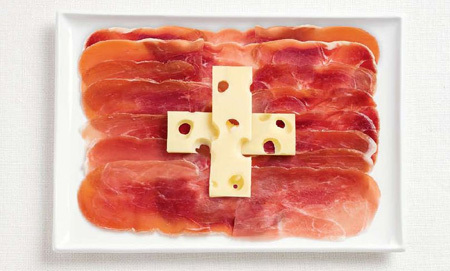 makes me want to come up with something for next 4th of july, or move to France, Italy or Greece because those flags look tasty! i try to do like this for my country flag (malaysia) but it become so difficult . Where is The Union Jack? Animals are alive, but many of them are also food. When people get confused in where to place their sympathies, we get groups that think eating food is somehow wrong. People for the Eating of Tasty Animals, the new PETA. You should make one <3 ! Mmmmm, gotta love me some Lebenon. 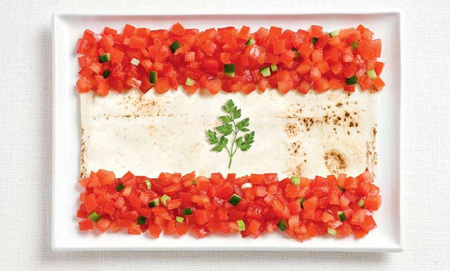 I want Taboule now. Oh and what is in Vietnam flag? Those pink puff ball things are way cool. Are they like fruit? For those wondering where the flags of other countries are, it does say that these were the flags of participating countries. Maybe places like the U.S. and the Philippines weren’t participating in the Sydney International Food Festival? Just a guess. I am a bit insulted that people seem to think that hamburgers and french fries are the only things we Americans have to offer. We actually have a wide variety of unique and delicious foods and do not deserve to be stereotyped like this. As for the vegetarianism-related comments, I’m not sure what this is accomplishing. Everyone else came here to look at pretty pictures of food, Edward. Additionally, you’re insulting all of the countries with meat as a traditional food (although only three or four of the twelve incorporate meat in their flags). It was at one point necessary for humans to eat other animals, and although many first-world countries now have the ability to forego meat if they so choose, not everyone has that luxury. Meat remains a staple in the diets of many cultures, and for you to judge them for this fact is absurd. As a vegetarian myself (for health reasons, not so much the animals’ rights), I at least acknowledge that others may not have the privilege of choosing exactly what they eat. Impressive indeed! I’m sorry for repeating if someone’s already mentioned this, but for all of you suggesting your countries’ flags done, getting colors right is not enough for a flag like this. 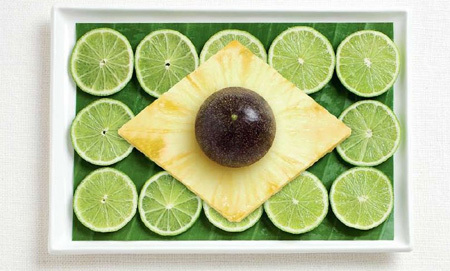 It also has to be made of groceries representing the given country. You should make a Romanian flag as well!! -blue, yellow, red. Thank you! 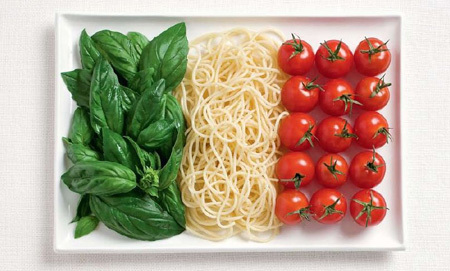 The Italy one is my favourite and one I would eat! D: Where’s the German and Hungarian flag?! The best foods are the italian and the hungarian. Where is the hungarian flag???????? Followed by the Japanese flag. 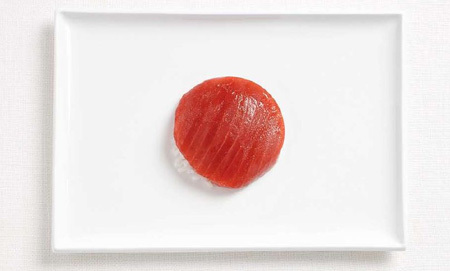 Tuna sashimi ought to do the trick I think! Where is the Dutch flag? I bet the designers were not from the Netherlands! I can understand why you have said what you have said but why do you say it here? what about leather surely artwork is not a disrespectful as actually wearing the former hide of a cow. and what makes you think that nobody ate these? Here you should do an Irish one. So obvious; Cabbage, Potatoes and Carrots. 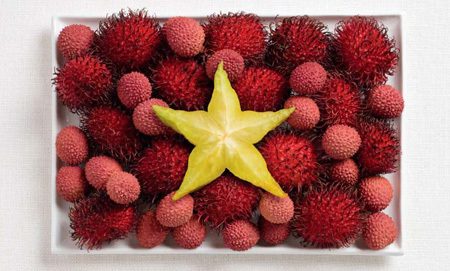 The pink puffballs are lychees, which are arguably the most delicious Asian fruit around. I see how they used the foods native to that country as well. Beautiful and delicious!! @astrodex: Did nature really intend for us that we keep animals in a prison waiting to be eaten? Don’t compare factory farming to what lions do. 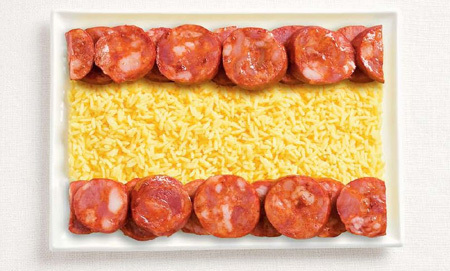 Where the hell is ‘Merica in this food flag shenanigans? They could have at least made it out of double cheeseburgers and such. ayyyy where’s the malta, oh come on! It also has to be made of groceries representing the given country.